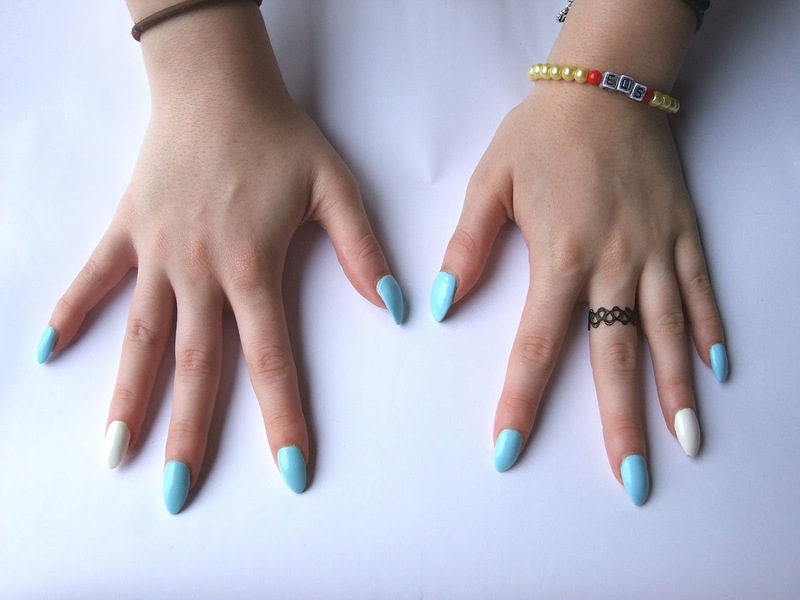 Woah, just looked at my last nails post and it was nearly a month ago! I waited quite a while to get my nails done just due to stuff that was going on, like not being able to walk very far. I've really wanted to go for the pointed nail look for a while now, and a few days when i was in the nail salon, i thought i'd try them out. Well there's no going back now, i absolutely love the shape! I think this shape of nail really elongates the fingers, which personally, i think looks a lot nicer. I didn't go for a sharp point, but more of a rounded point as i wasn't too sure how it was going to look, but i absolutely love them! I don't really own or wear anything that is blue. I don't know why, but it's something that you don't really see in my wardrobe. After looking on Pinterest at what kind of nail design & colour i wanted, i saw a really nice pale blue, and i instantly know that's what i wanted. I always have to do something different on my fourth finger, so i thought that a white nail would really compliment the blue. I'm probably going to get them done again in just under 2 weeks so that my nails are looking fabulous for the #BigBloggerConference! Let me know if you're going! I'm super excited! So great!! I recently tried pointed nails but the press on ones.